Does your little one love soccer? We do too. It’s a great sport that all levels of ability can share. And we use our highly-successful, age-appropriate curriculum to teach technique in a fun way. 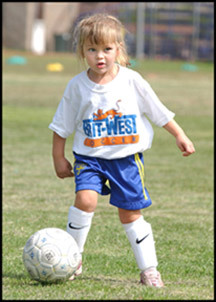 You’ll be amazed at how quickly your child develops the basic skills that are the stepping stones for playing soccer. And as those skills improve each week, we include a small-sided game to help put those skills in context in a game situation. Of course we’d be thrilled if any of our Tiny Pros became the next “Beckham,” but our real goal is to instill our little team with confidence, coordination, friendship, and a love of the game. Please read: NEW DATES! SIGNED RELEASE REQUIRED. To access the MINORS’ POLICIES & RELEASE, click Forms & FAQs in the left sidebar or copy & paste this URL into your browser: http://tinyurl.com/minorsrelease.